An international team, directed by scientists from the University College London (UCL) in the UK, has been able to study the atmosphere of an exoplanet- 55 Cancri e, for the first time. It’s about eight times the mass of our own Earth, so also called the Super-Earth. It is located in the planetary system which is about 40-light years away from Earth. The researchers by using the Wide Field Camera 3 (WFC3) on the NASA/ESA Hubble Space Telescope, observed that this exoplanet has a dry atmosphere consisting mostly of hydrogen and helium, with no sign of any water vapors. The researchers gathered the observations made by scanning the WFC3 swiftly across the star to generate a number of spectra. By coalescing these observations through analytic software, the researchers obtained the spectrum of 55 Cancri e surrounded in the light of its parent star. This is for the first time that the atmosphere of a Super-Earth has been observed. The WFC3 has already been used to explore the atmosphere of other two Super-Earths, but couldn’t get any information at that time. 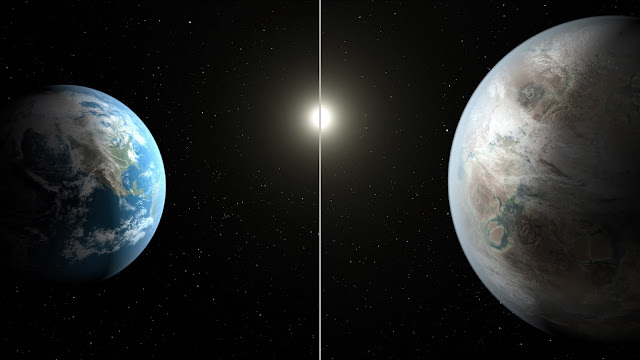 Super-Earths are considered to be the most common type of planet in our galaxy. They are called as Super-Earths because of their huge size but still smaller than the gas giants of our solar system. “If the presence of hydrogen cyanide and other molecules is confirmed in a few years by more modern infrared telescopes, it would support the theory that this planet is indeed carbon rich and a very exotic place. Although hydrogen cyanide, or prussic acid, is highly poisonous, so it is not a planet we would like to live on!” said Jonathan Tennyson, fromthe UCL.